Fromage-du-mois friends may remember an early post on this site, in 2006, about Manchego. For those who missed it, I thought I'd re-introduce this simple staple of the cheese world. Many people have probably heard of and/or tried Manchego (Queso Manchego, officially). If you haven't, I would encourage you to give it a shot. 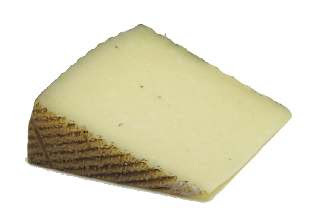 Manchego is a very nice, 'nutty'-flavored, Spanish sheep's milk cheese. It is still Spain's "most popular cheese" and it remains name-controlled: it must be made in its region of origin to be called (Queso) Manchego. Manchego hails from the expansive, sometimes barren region of 'inner Spain' called Castile-La Mancha (the link is from El Sol Villas, which offers vacation villas throghout Europe). Apparently, the expansive plains of La Mancha are subjected to a climate of seasonal extremes, often pummeled with unrelenting winds and broad sweeps in temperatures throughout the year (read: Don Quixote and his windmill travails). The thick-fleeced sheep of La Mancha, who provide the milk for this ubiquitous fromage, are some of the only animals able to withstand this climate. Manchego is usually quite mild, a little bit briny, and tastes like it is "of the earth", if that makes any sense. And the common description of it being "nutty" I think is especially accurate. Like many cheeses, it becomes more acrid and tangy when it is aged. The seal (above) is Queso Manchego's official Protested Designation of Origin (PDO) Seal, certified by the European Union. It can be placed only on Manchego cheese wheels when they are produced from the milk of La Mancha's sheep, and, aged for at least 60 days. Literature fans will note that the seal includes a silhouette of the famous "Don Quixote" on his horse, and---I believe--a second, rider-less horse by his side (or.....does anyone see Sancho Panza on the second horse?). Thanks for the authoritative post, Ricky R. I have a friend who said that his father eats so much machego that it's "manchegi" to him. I think that's like saying that he drinks so much Johnie Walker that it's "Jack" to him. I bring this up not because they drink a lot of whiskey and eat a lot of machego in Castilla as a general rule, but because I've always wondered: Who are those old guys sitting at Madrid's Plaza dos de mayo nibbling at a plate of machego and milking their morning whiskey? Sancho's progeny, to be sure.